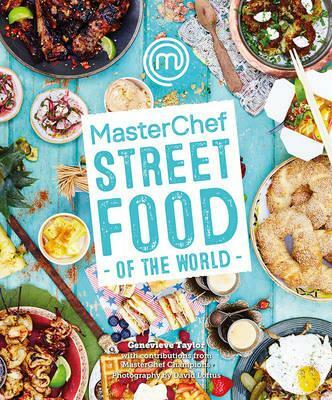 MasterChef Street Food of the World is a no holds barred celebration of a food trend that continues to grow exponentially, delighting and enticing foodies. This exciting new book takes inspiration from the success of hugely successful pop up restaurants that continue to delight in their sheer theatre, as well as the street food vans and street food festivals that proliferate worldwide. From burritos, churros and pretzels to shrimp po’boy, Pad Thai or aromatic buns, it is estimated that 2.5 billion people per day eat street food across the world–a staggering figure. From affordable snacks to the more up-market, this collection will focus on the celebration of fresh and local ingredients and different cultures and cuisines. Often quick and easy to make, these recipes will delight the home chef who wants to create sensational street snacks in their own kitchens. Written by the brilliant Genevieve Taylor, the book also features recipe contributions from MasterChef winners from around the world. 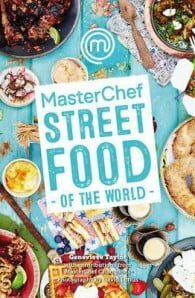 Publishing in March 2017, MasterChef Street Food of the World will be split into chapters celebrating the best of each nation and continent, with photography from the legendary David Loftus to create a striking, vibrant and colourful book. Genevieve Taylor is both a gifted food writer and a food stylist with a delicate aesthetic touch. Her first book, Stew! was published in February 2011 and her follow-up book, Soup! in March 2012. Her latest title Pie! is due for publication in March 2014. She lives in Bristol, with her family and a more-than-is-sensible collection of rescued pets. She is one of the brightest voices in food around. Find out more about Genevieve at genevievetaylor.co.uk.